DAKAR, July 7 - Senegal's President Abdoulaye Wade has said he must "learn a lesson" from violent protests against his government, but did not specify whether this would alter his controversial plan to stand for re-election. The message follows a blunt warning earlier this week from former colonial power and close ally France against Wade seeking to cling on to power. 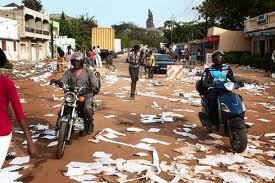 Senegal has long been seen as a model of democracy and stability in West Africa. But some argue Wade's aim to seek a third mandate in the February 2012 election breaks rules on term limits, while rolling power cuts and the rising cost of living have led to street anger boiling over. Speaking on Senegal's state television late on Wednesday, Wade recognised that "regrettable incidents" had taken place, "underlining the fragility of (Senegal's) democracy". "I must learn a lesson from this and I will," Wade, 85, added, without giving further details in his first public address since the protests began. Troops and armoured vehicles were deployed outside government buildings on June 28 after riots over power cuts. Wade earlier had been forced by violent street protests to backtrack on plans to reduce to 25 percent the minimum score needed to win next year's election in one round -- a move critics say would have allowed him to coast home against a fragmented opposition. The president's critics argue Wade cannot stand for re-election as he already would have completed two terms in office but his camp says changes to the constitution during his first term meant he had the right to another stint in office. Critics also accuse Wade of seeking to line up his son Karim, a powerful but unpopular minister in his government, as a possible successor, should be need to stand down. The crisis has complicated the relationship between Senegal and France, the former colonial power that retains close links with Dakar and has relied on Wade for diplomatic support in the region, especially most recently in Libya. "President Wade has clearly called for the departure of (Muammar) Gaddafi in Libya. I am very tempted to say that we need to ensure that the the same causes do not lead to the same effects," French Foreign Minister Alain Juppe said. "Staying in power at all costs, including tweaking the election law to be elected with 25 percent of the vote and not instigating reforms called for by the people, will sadly always end with the same result," Juppe said on Tuesday at the French parliament's foreign affairs committee. Karim Wade this week rejected the charges that a monarchy-style succession plan was in place and he complained of a hate campaign in the media.